One is the developmental side of the Indian national team and the other is a side that wants to develop with just Indian players. It's really hard to pick a side when both of them face each other. But when Indian Arrows' Asish Rai pounced on a poor clearance and fired the ball into Shillong Lajong's goal back in November, one can't help but admire the fearless nature of the Arrows and the passion for the game in Asish's goal celebration (Watch the goal here). 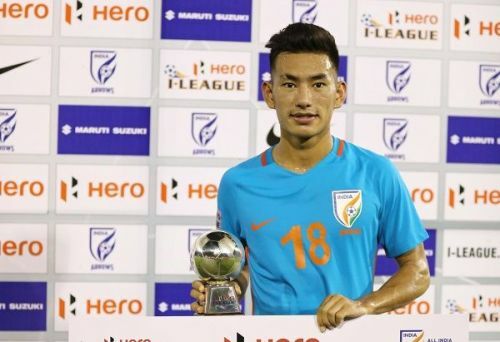 Son of a farmer from Sikkim, the 19-year-old Asish is a vital cog in the Indian Arrows side, having featured in nine of their 13 games so far. 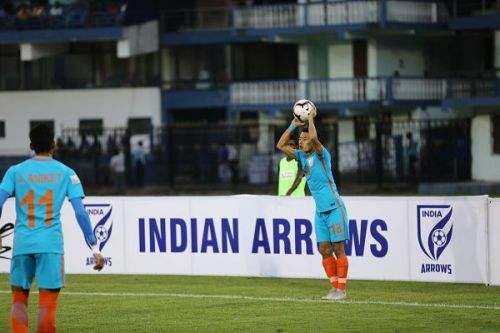 And contrary to the perception that Indian Arrows are playing only for exposure to top division football, Asish says Arrows are in it for the results too. "Yeah of course exposure helps us because we play against much-better sides but the results do matter to us too," Asish says. "Wherever we go, whichever team we play against, our boys are always there for the win. They give everything that they have throughout the 90 minutes. "However, you must understand that it’s a game of football. Sometimes we lose, sometimes we win. But apart from that, we all learn things in every game that we play." Asish took to football as one of the many Sikkimese players inspired by the exploits of Bhaichung Bhutia. Asish hails from Pakyong as well, a small quaint town which is now bustling with activity after the only airport in Sikkim came up there. Like his town, only the sky is the limit for Asish. And so he set off for the mainland, honing his skills at the FC Pune City academy before catching the eye of the national team scouts. "I learnt most things about football at the Pune Academy," Asish says. "There were such great coaches like Naushad Mousa (the Bengaluru FC academy coach now), Sujay Sharma (currently the head of player recruitment at FC Goa) and (Dave) Rogers (former DSK Shivajians coach). I got to learn so many things from them and I’m really thankful for the time I spent there." After finishing at the bottom of the table last season, Arrows are now eighth on the I-League table with 13 points in 13 games. The lack of experience came to the fore when Arrows let slip a one-goal cushion to lose 4-1 to Chennai City FC in the opener. The win against Shillong post that was considered a one-hit wonder. But Floyd Pinto's boys followed it up with sensational victories over Gokulam Kerala, Aizawl FC and Lajong again with Asish playing an influential role as the right-back for the side. "The victory against Shillong Lajong was essential for us to break out of the bottom pile," Asish says. "We stood together, we worked together and we got the result. "For me, there are no matches that I think on personal terms (despite me getting that goal against Shillong). I always think for the team." And then came the move to Indian Arrows. Asish made his debut under Luis Norton de Matos, who also coached India in the 2017 U-17 World Cup. Overall, Asish admits playing for the developmental team of the All India Football Federation (AIFF) has done his football a lot of good but he soon hopes to move onto the senior national team as well as bagging a lucrative contract with an Indian Super League (ISL) side. "Right now, Floyd Pinto is a great coach with an acute tactical mind. He knows a lot of those technical things and for young players like us, we need the make the most from him. His game plans are better. "Under the previous coach (Luis Norton) De Matos, who also coached India in the U-17 World Cup, I learned lots of things. He gave me lots of confidence in playing and I am most happy about that." "It’s a great experience for me to play with Arrows. The entire team has only young players and playing against teams like East Bengal, Mohun Bagan and others help us get more experience as they have got some good foreign players in their ranks. We can learn new things from them and that's the most significant aspect of playing for Arrows. "Within the next five years, I hope to move up to the national team and play in the ISL too."